The Turks and Caicos are two groups of islands situated southeast of the Bahamas on the edge of the Caribbean Sea. These islands were home to the indigenous Taino people prior to the arrival of Europeans; they were sighted by Ponce de Leon in 1512, and were successively claimed by Spain, France and England. One of the first permanent settlements was established by Loyalists who fled the nascent United States following the Revolutionary War. While the islanders have experimented with various forms of home rule over the years, they remain British subjects. Visitors today flock to the Turks and Caicos for their stunning beaches and crystalline waters that are especially favored by scuba and snorkeling enthusiasts. The economy is also supported by a thriving financial sector similar to that in the Caymans. 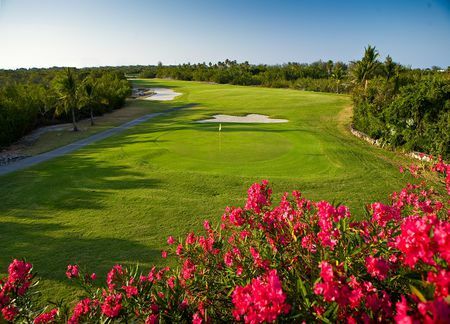 Another attraction is one of the finest golf courses to be found anywhere in the Caribbean. Provo Golf Club, which opened in 1992, is located on Providenciales, the most populous of the Caicos Islands. The club occupies a bit of tropical paradise, where palm trees mark the fairways and it's hard not to be distracted by the shimmering blue water. The par 72 layout has twice hosted the Caribbean Amateur Championship.